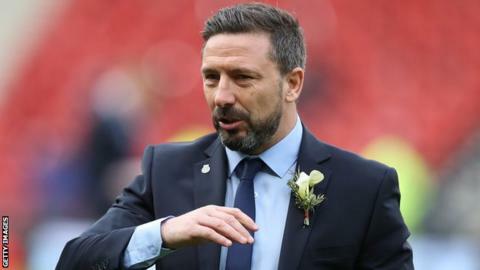 Championship side Sunderland are in talks with Aberdeen boss Derek McInnes over their vacant managerial position, BBC Newcastle reports. Former Scotland midfielder McInnes guided the Dons to second place in the Scottish Premiership last season. The 45-year-old has been in charge at Pittodrie since April 2013. It is not known whether he is the only candidate to replace David Moyes, who resigned following the Black Cats' relegation from the Premier League. McInnes began his managerial career at St Johnstone in November 2007, leading the Perth side to promotion to the Scottish Premiership in the 2008-09 season. He left to take charge at Bristol City in October 2011, but was sacked in January 2013 with the club bottom of the Championship. The former West Brom captain replaced Craig Brown as Aberdeen boss three months later, and has since won 112 of his 199 games in charge. His contract at Pittodrie runs until 2019, and Aberdeen are reportedly seeking a compensation package worth around £1m for his release.